Do you suffer from cracked and chapped lips? Cracked lips are not only cosmetic problem; it can be quite uncomfortable and painful having cracked lips. Here are some simple tips that you can do at home to treat the cracked lips naturally. First of all, increase your intake of vitamin A rich foods such as green leafy greens, legumes, whole grains, and all yellow and orange fruits and vegetables. You can also help your lips by drinking loads of liquids thorough the day to keep the lips moist and hydrated. Generally avoid licking your lips with your tongue, since this can dry them out even more. 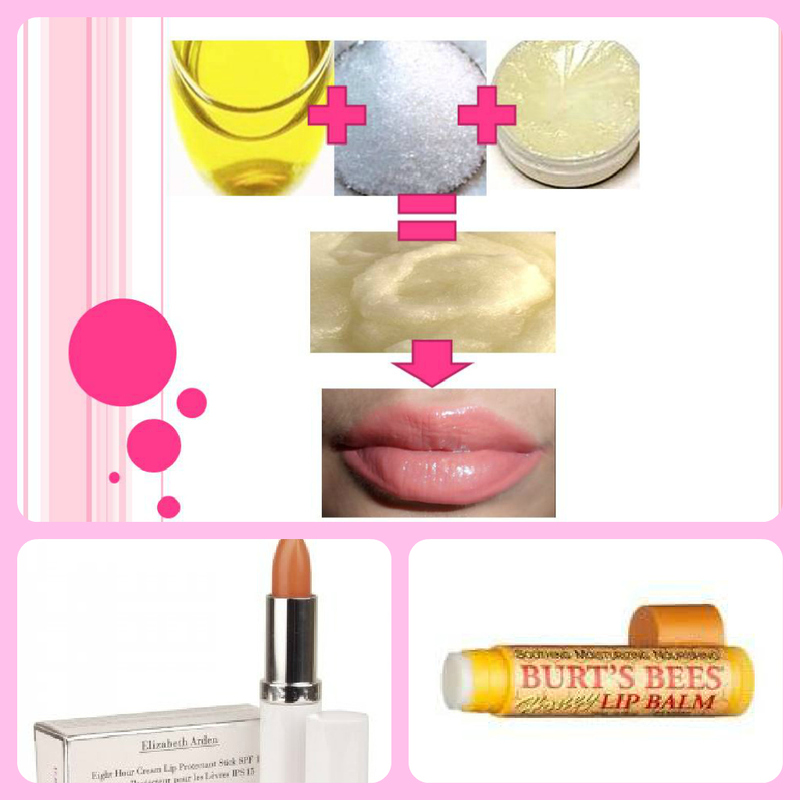 If your lips are already badly chapped mix 1tsp. each of olive oil, sugar and petroleum jelly, apply on the lips, leave for about five minutes and then scrub your lips for another minute with the paste. That should get rid of flaky bits and remove dead skin on your lips and also deep moisturize the lips at the same time. Always use lip balms throughout the day to keep your lips and moisturized. My favorite lip balms are Elizabeth Arden 8 Hour Cream Lip Protectant Stick and Burt’s Bees Lip Balm, and I can highly recommend them both. I was recommended Elizabeth Arden 8 Hour Cream Lip Protectant Stick a couple of years ago when I was suffering from terrible cracked and painful dry lips and I to date it’s still my favorite lip balm. I feel like shouting out to the world, that people must go and get this. It's really moisturizing on my lips and it stays on so there's no need to constantly re-apply. I just love how it feels on my lips, so soft and smooth. I have also used it on my cuticles and dry skin patches in my face without any problems. Too bad this is pretty expensive for a lip balm. Cost in Ireland 22.50 Euro. If you are looking for a cheaper alternative to the Elizabeth Arden 8 Hour Cream Lip Protectant Stick, then try Burt’s Bees Lip Balm. This lip balm is more on the waxy side, so it's drier and you can definitely feel the wax on the lips, but it really does a great job moistening my lips and it lasts on my lips for awhile. It truly is soothing, cooling, and refreshing. Cost in Ireland 3.50 Euro. Also apply lip balm every night before you go to bed and you will wake up every morning with smooth and moisturized lips. What are you tips for chapped lips? Any other home remedies or lip balms you recommend? I love Burt's Bees - that stuff is awesome!